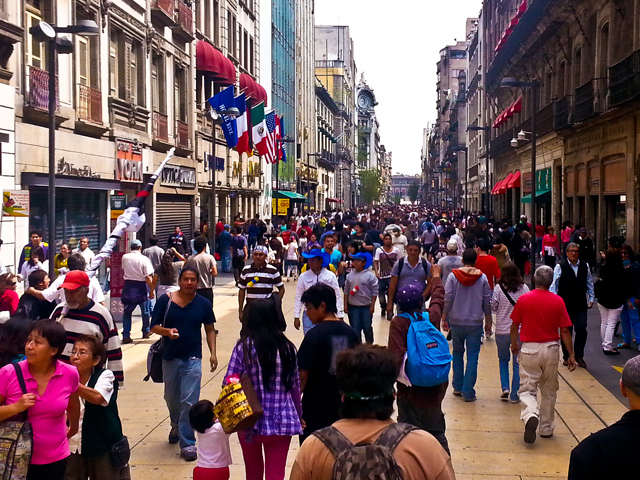 Mexico City has already transformed its historic downtown to be more pedestrian friendly. What would the city look like if it continued in the car-free direction? Photo by Justin Swan/Flickr. Previously on TheCityFix, we took you through the initial steps of EMBARQ and IDEO’s project to explore how human-centered design thinking can be put to work for sustainable urban mobility. We’re asking a bold question – what if there were no need for cars in the world’s biggest cities? – and looking for bold solutions. Taking this question to the field in Mexico City, Mexico and Helsinki, Finland revealed key insights for how we can make mobility systems more responsive to peoples’ needs. The key to human-centered design is asking the right questions to the right people. To do this, we searched far and wide for inspiration and ideas, no matter how eccentric or seemingly impossible. We started in Helsinki, which last year set the ambitious goal to be car-free by 2025. The city is using technology and consolidated services to build a “mobility on demand” system, greatly reducing the relative convenience of personal cars. From there, we went to Mexico City and interviewed both everyday commuters and mobility experts. The people we met reflected a wide range of attitudes towards urban transport. We spoke with Beatriz, a busy mom who runs errands all day and needs a car to get from point A to B and even point C; Mitzy, who is afraid of public transport because she does not know how to use it; Abril and Erick, who commute five hours to work each day so they can drop off their children in a community they trust; Fernando, who had enough of public transport, bought his first car, and loves it; and Mercedes, who makes all her life choices based on avoiding car trips to give her kids a different city experience. Now, we’re working to translate this understanding about mobility needs at an individual level into game-changing transport solutions at the city level. The search for trust guides people’s mobility choices: Whether you decide to drive alone, share your ride, or use mass transport, how we use transit systems depends on whether they make us feel safe. Social validation is the starting point for people to adopt new mobility services: With new mobility services, people need to see them in action, see others using it, and have the right information to understand how they might work for their own needs. Life changes force people to make adjustments in mobility habits; these changes are rarely proactive: Changing jobs, moving homes, having a child, becoming a student, or getting a first job are moments when people re-evaluate their mobility options. Current systems are not designed to capture those moments and match them to options. People reward quality service with care in use: Loyal users come from good service design and operation. If transport services demonstrate they care about the human experience, they are rewarded with consistent users. Barriers to using public transport present themselves before the journey even begins: Commuters need information to understand how to incorporate transit in their door-to-door travels. Having a system that is responsive to their needs is important. Furthermore, long, complicated rides with multiple transfers push people away from public transport. While there are a variety of transport services, people mainly receive one service experience: In Mexico City, transport systems such as the Metrobús bus rapid transit (BRT), the metro, the suburban train, traditional bus systems, and the Ecobici public bike-sharing system are disconnected. Rather than providing an integrated, multimodal experience, they have diverse entry points, payment methods, user information, and quality of service. Reimagine the commute: How might we build infrastructure and services that support connections between formal and informal transit? How might we help companies help their employees get to and from work energized and safe? Reimagine the errand: How might people access goods and services? How might we facilitate more efficient route diversions or eliminate them all together? How might we expand existing circles of trust to drive new shared mobility solutions? Reimagine the ride: How might we differentiate transport options with varied services levels that appeal to people’s identity? How might we nudge new, sharing behavior that leads to better trips for all? How might we use data to enhance the quality of transport, from planning your route to paying through one system? While these lay out a number of different potential paths, one thing in particular stands out: to be car-optional, we need to build a basket of options that address our mobility needs as well as a car does. We need to reimagine our approach to mobility. With a new perspective on individuals’ mobility needs, IDEO took the lessons learned back to the field to further test assumptions and prototypes. Look for the next blog in this series to learn about prototyping and to see the results which will get us closer to mobility choices that work for people. Acknowledgements: The EMBARQ project with IDEO is underwritten by Mr. Carlos Rodriguez Pastor and the William & Flora Hewlett Foundation, with additional support from General Motors and TransitCenter. EMBARQ is the sustainable mobility practice of WRI Ross Center for Sustainable Cities, a program of the World Resources Institute. What if there were no need for cars in the world’s biggest cities?